Offers:Up to £480 off selected dates. 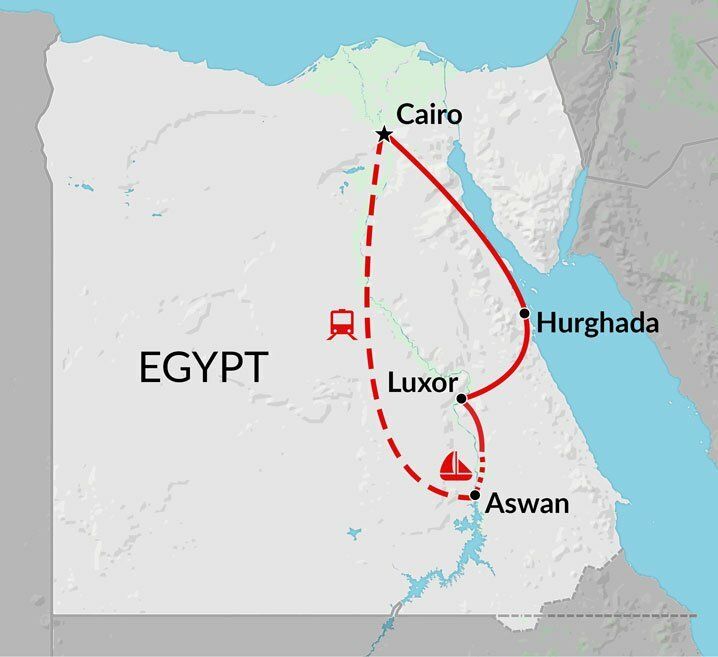 Budget tours of Egypt don’t get any more exciting than this excellent two week itinerary that takes in the highlights of Cairo prior to heading to the temples of Philae and the engineering feat of the Aswan High Dam by overnight train. Time spent exploring the souks and market places of Aswan are matched with an optional visit to Abu Simbel where you’ll be able to see the stunning temples created by Ramses II. Traditional overnight felucca cruises on the Nile are an exceptionally peaceful way to travel with the temples of Luxor, including the Valley of the Kings and the temples of Karnak, adding to the exhilaration of arriving afloat. After also experiencing the lesser-visited Colossi of Memnon and the Medinat Habu, your tour of Egypt continues to the Red Sea resort of Hurghada where watersports activities and chances to ride on a camel complement cultural discoveries before you return to Cairo overland or by air. This particular tour visits the Red Sea area of Dahab. We encourage travelers to not throw any of their beer bottles on the beach and we also warn against any beach fires without the supervision of one of our tour leaders. This is how we prevent the local environment from being polluted. They also have an opportunity to snorkel and dive in Dahab. We instruct every person who takes part in this to not pick at the coral reefs while snorkelling. In Dahab, there are a number of street children who sell hand made crafts. We inform travellers that it is up to them to buy these from the children, but we do not encourage them to hand out large numbers of money, as it contributes to the problem of begging and to a large extent, pick pocketing. It definitely supported the local economy but Egypt is a tip head. lights. Accommodation was good overall. There were a number of highlights so I will have to cheat and say two, the time spent on the Fullucca and the hot air balloon ride. Well seeing as tourism is significantly down in Egygt, every little helps. I thoroughly enjoyed my holiday, great organisation, very accommodating, great people and sights and all at an affordable price. Guide Waleed, unforgettable. Nothing was too much trouble. Sufi dancing (an optional event) was stupendous. Felucca overnight. Valley of Kings - King Tuts tomb. Snorkelling in Red Sea. On no account go to the hotel we went to in Hurquada (Hostmark) It was the worst hotel I have ever stayed at. We are still smarting from the fact that the local office of the operator refused to move us or refund us. The service was execrable, beyond belief. We now understand that the operator are no longer going to use this hotel though this is of scant comfort to us. Thank God it was only 3 days (though seemed much longer). Everything, apart from the 3 days we spent at the above hotel, was fantastic. Very diffiuclt to pick out any individual highlights as the whole tour was incredible. Yes. I think that the tour was organised to be sympathetic to the local communities and encouraged us all to be aware of the impact of tourism (positive and negative) on the economy and environment of egypt. Definitely ten out of ten.